The heteroligand complex of manganese with 1,10-phenantroline and o-nitrobenzolazosalicylic acid has been investigated by spectrophotometric method. The condition of complexing and extraction, physical-chemical and analytical characteristics of this complex have been found. Complex formation is observed in the pH range 5 - 11. Extraction constant was found as 5.3 × 1012, stability constant was found as lgβK = 9.03 ( 0.03. Molar absorptivity is ( = (1.36 ± 0.08) × 104 l∙g−1∙cm−1. Beer's law is obeyed in the range of 1.0 - 22.5 µkg manganese (II). The extraction-photometric methods of manganese determination have been worked out. The influence of diverse ions on determination of manganese (II) has been studied. The proposed method was applied successfully to determine amount of manganese in tap water. Manganese is considered to be the 12th most abundant element in the biosphere. Its concentration in earth crust reaches as high as 0.098%. It is widely distributed in soil, water, sediment and biological materials. Manganese has cumulative properties. Due to this accumulating in the organism chronic manganese excess affects the central nervous system, with the symptoms resembling those of Parkinson’s disease   . Various methods for the determination of manganese with chromogenic organic reagents have been reported. The reagents suggested for determination of manganese include: toluidine blue  , Mordant brown 33  , phenoxazine  , eosin  . Along with the advantages of these methods, there are also disadvantages. Although molar absorptivity in  is high, but constant stability is very little. In  , molar absorptivity is very less than in current method. In the literature there is data on the use of o-nitrobenzolazosalicylic acid for determination of nickel, zinc, ferrum, cobalt  - . But no data about determination of manganese with o-nitrobenzolazosalicylic acid can be found in the literature. The heteroligand complex of manganese (II) has been investigated with 1,10-phenantroline (Phen) from aromatic diamines and with o-nitrobenzolazosalicylic acid (oNBASA) from chromogenic organic reagents and thenew rapid, simple and sensitive extraction-photometric method of manganese determination with these reagents have been worked out by us. Absorption measurements were collected on a СФ 46 “LOMO” (Leningradskoe Optiko-Mexanicheskoe Obedinenie) spectrophotometer or КФК-3 “ZOMZ” (Zaqorskiy Optiko-Mexanicheskiy Zavod) photoelectrocolourymeter using 1 cm cuvette. The pH-meter EV-74 (Q. Qomel, Zavod Izmeritelniypriborov) is used for pH measurements. Stock solution of 1.52 × 10−2 M manganese (II) was prepared from MnCl2∙4H2O salt with qualification “p.f.a.” (pure for analysis) and quantity of manganese standardized gravimetrically with o-phenantroline and SCN−  . Working solution of 4.5 × 10−4 M manganese (II) was prepared by dilution of stock solution with deionized water. Solution of oNBASA with 5 × 10−3 M concentration was prepared by dissolving the required amount in water, while pH of this water was arrived to 12, previously. Because, pK1 = 3.16 and pK2 = 12.30 for oNBAST. Solution of Phen with 1 × 10−2 M concentration was prepared by dissolving the required amount of preparate which was productioned in firm “Chemapol” in ethanol: water (50:50, by volume). Universal or borate buffer solutions (H3BO3 + HCl, H3BO3 + NaOH) or 0.1 M CH3COOH and 1NNaOH solutions were used for obtaining appropriate pH. Appropriate amount of solutions of Phen and oNBASA have been added to the definite amount of solution of manganese (II) in test-tube with stoppers or in separatory funnel. Then total volume have been diluted to 10 ml by adding of different (pH 5.0 - 11.0) buffer solution. The mixture has been shaked for 1 minute with adding of 5 ml solvent (chloroform). Colored extract (organic phase) has been transferred to the cuvette when the phases separated and absorbance has been measured relative to the water. The analogical experiment has been carried out without manganese and absorbance of the extract of reagent has been measured also relative to the water. Investigations show that the derivatives of salicylic acid form colored complexes with transition metals  - and this can be used in developing an extraction-photometric methods for the determination of these metals, also of manganese (II). The absorption spectra of chromogenic organic reagent and complex of manganese with Phen and oNBASA obtained in the pH range 5.0 - 11.0 of the aqueous phase showed that manganese (II) with Phen and oNBASA forms a complex one composition.The absorption spectra of solutions of reagent and the complex show that the maximum absorbance takes place at pH 10 (Figure 1) and wavelength of 370 nm have been selected for the present work (Figure 2). The influence of the concentration of Phen and oNBASA was studied. The optimal concentration of Phen and oNBASA for formation of the complex was found to be 6 × 10−4 M and 2.5 × 10−4 M, respectively. Figure 1. The influence of ph of the aqueous phase in the formation and extration of the complex of manganese(II) with Phen and Onbasa. ( = 2.23 × 10−5 M, CPhen = 2 × 10−4 M, CoNBASA = 1.5 × 10−4 M, КФК-3, λ = 400 nm). Figure 2. Absorption spectra of extract of Mn2+—Phen-Onbasa and Onbasa ( = 2.23 × 10−5 M, CPhen = 2 × 10−4 M, CoNBASA = 1.5 × 10−4 M, pH = 10, CФ-46, l = 1 cm). form is preferably in the aqueous phase. The heterolig and complex of manganese (II) with Phen and oNBASA was extracted with chloroform and 1,2-dichloroethane. Optimal volume of aqueous and organic phase was found to be 25 - 50 and 5 ml, respectively. Mn-Phen-oNBASA complex is formed immediately after adding the reagents and extraction equilibrium is achieved by shaking up 1 minute. The sequence of reagents to be added does not affect the complex formation and extraction. The intensity of color of the complex does not change depending on time and stable during the day. The stoichiometric coefficients of the complexing were established. The molar ratio Mn:Phen:oNBASA was proved by the method of straight line and crossing the lines  . The results for the light absorption of the extracts at 370 nm showed that the complex was formed at a ratio Mn:Phen:oNBASA = 1:2:2. 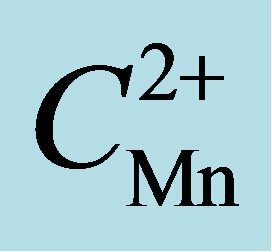 By the method of V. A. Nazarenko  was established that the complexing form of manganese are the ions Mn2+. The same amount of complex two times was extracted consistently and extraction percentage was found: 98.76%. Extraction constant was found as 5.3 × 1012, stability constant was found as lgβK = 9.03 ± 0.03. By the method of Komar  was found molar absorptivity is e = (1.36 ± 0.08) × 104 l∙g−1∙cm−1. Beer’s law is obeyed in the range of 1.0 - 22.5 µkg manganese (II). Equation of the calibration curve was based to be A = 0.038C + 0.01. Calibration curve are presented in Figure 3. The relative standard deviation for 5 determinations with 1.0-5.0-10.0-20.0 µkg of manganese(II) of the method is ±(1.69 - 2.19)%. The detection limit of manganese was found as 0.004 µkg∙ml−1. Statistical results are presented in Table 1. In order to assess the usefulness of the proposed method the influence of strange ions on the extraction-photometric determination of manganese was studied. The tolerance of the method of foreign ions was investigated with solutions containing 10 µkg Mn (II) per 25 ml and various amounts of foreign ions. Mn (II) was determined as Mn(Phen)2(oNBASA)2 under the optimum conditions as described in the experimental procedure. The determination of manganese was possible in the presence of Li (I), Na (I), K (I), Ca (II), Sr (II), Ba (II), Cd (II), Hg (II), Al (III), Ti (IV), Zn (II), V (V), Cr (III), Mo (VI), Ni (II), Pb (II), As (V), Mg (II), Bi (III), In (III), Ge (IV). But Co (II), Zn (II), Cu (II), Fe (III), Ag (I) ions were influenced on the extraction-photometric determination of manganese (II). Water sample was taken in the flask 2 l and was evaporated to dryness. Dry residue was dissolved in a buffer solution with pH 10 and by filtering was transferred to a 50 ml flask. 2 ml aliquot part was transferred to the separatory funnel or test-tube. 0.6 ml Phen and 0.5 ml oNBASA was added. Then was diluted by the same buffer solution to 10 ml and was extracted with 5 ml chloroform for 1 minute. Absorbance was measured in СФ 46 in the cuvette of 1 cm when the phases separated. 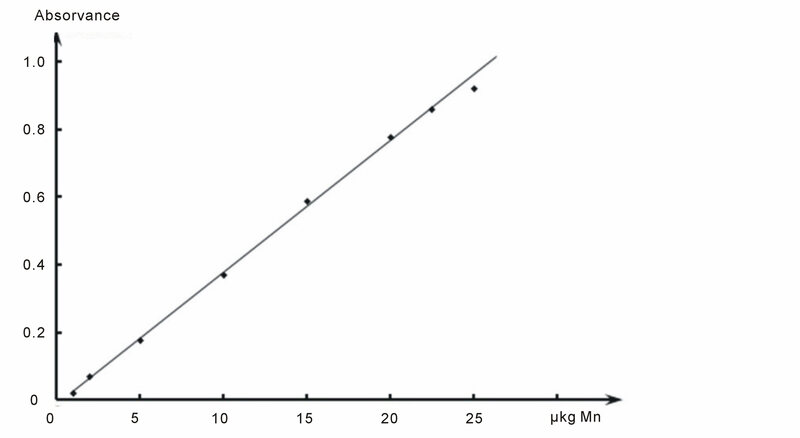 Amount of manganese was determined from the calibration graph.The results were compared with the results of the determination method of manganese wich referenced in  : 0.02 ± 0.01.Amount of manganese have been determined in tap water by the proposed method: 0.018 ± 0.009 µkg/ml. Comparison of methods of manganese is presented in Table 2. Figure 3. Calibration curve of determination of manganese with Phen and oNBASA. Table 1. Statistical results of determionation of manganese with Phen and oNBASA (n = 5, p = 0.95). Table 2. Comparison determination methods of manganese with proposed and referenced. (Phen) and o-nitrobenzolazosalicylic acid (oNBASA) from chromogenic organic reagents. The new rapid, simple and sensitive extraction-photometric method of manganese determination with these reagents has been worked out and applied to determination of manganese (II) in tap water by us. Marbaniang, D.G. (2012) Spectrophotometric Determination of Manganese in Ground Water in Shillong City Using Bismuthate Oxidation Method. International Journal of Environmental Protection, 2, 22-26. Seleim, M.M., Abu-Bakr, M.S., Hashem, E.Y. and El-Zohry, A.M. (2009) Spectrophotometric Determination of Manganese (II) with Mordant Brown 33 in the Presence of Tween 20 in Some Foods. Canadian Journal of Analytical Sciences and Spectroscopy, 54, 93-101. Mghimi, M., Syed, A.A., Al-Okab, R.A. and Taghartapeh, M.R. (2010) Application of Electrophilic Coupling Reaction as a Novel Spectrophotometric Methods for the Determination of Manganese. International Conference on Biology, Environment and Chemistry, 337-340. Rustamov, N.Kh., Mustaphayev, N.M. and Rustamova, U.N. (2004) Photometric and Extraction-Photometric Determination of Nickel with Azoderivative Salicylic Acid and Ligands with N-, P-, O- . Journal of Chemistry and Chemical Technology, 47, 15-20. Rustamov, N.Kh. and Bayramova, T.D. (2005) Heteroligand Complexes of Zinc with 1,10-Phenanthroline and Alizarine Yellow R. Azerbaijan Chemical Journal, 4, 97-99. Rustamov, N.Kh., Aliyeva, A.A. and Agamaliyeva, M.M. (2003) Azoderivatives of Salicylic Acid in the Presence of o-Phenanthroline as an Extraction Reagent for the Photometric Determination of Fe(III). Azerbaijan Chemical Journal, 2, 54-57. Rustamov, N.Kh., Abbasova, G.G. and Mustaphayev, N.M. (2011) Extraction-Photometric Determination of Kobalt 4, 7-Difenil-1,10-Phenantroline and Alizarine Yellow R. Journal of Chemical Problems, 3, 495-497. Lavrukhina, A.K. and Yukina, L.V. (1974) Analytical Chemistry of Manganese. Nauka, Moskow, 315. Bulatov, M.I. and Kalinkin, I.P. (1976) Practical Manual of Photocolorymetric and Spectrophotometric Methods Analysis. Nazarenko, V.A. (1969) Proceedings of the Committee on Analytical Chemistry. Nauka, Moscow, 12.